A few weeks ago, I discovered that you can recycle soft plastics, turning your plastics into useful things like park benches and play ground equipment. 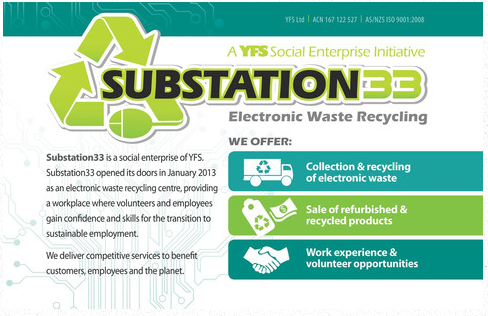 Today I discovered Substation33 a social enterprise based in Logan, Queensland, who recycle electronic waste, providing a workplace where volunteers and employees gain confidence and skills for the transition to sustainable employment. AWESOME! eWaste is the fastest growing waste stream to landfill. Substation33’s goal is to offer a cleaner, more Earth-friendly option for residents of South East Queensland to dispose of old computers, monitors, servers, office equipemnt, household appliances, mobile phones and all obsolete/unwanted electronic equipment. Your eWaste will be disassembled by their team of volunteers and the materials recovered are directed back into the manufacturing stream. The crew at Substation33 even boast that if they had a plug or a battery, they could recycle it. This entry was posted in Community, Environment and tagged eWaste, Logan, old tv, old washing machine, recycle, recycle electronic goods, Social Enterprise, Substation 33, Substation33. Bookmark the permalink.